A little while ago I wrote why I think gold is a bad investment, since than gold’s price has increased even more, reaching new highs. Investing in gold seems to be getting more attention. People invest in gold for different reasons and recently I got an email from a reader asking “if gold is a bad investment, why do people still invest in it?” I can’t really answer for everyone, but there are variety of reasons why people invest in gold and just because I think gold is a bad investment doesn’t mean others agree. Let’s look at some common reasons why people invest in gold. The US Dollar and Gold move in opposite directions, currently the US Dollar is weak and seems to be getting weaker due to economic policy, most do not see an end to this weakness and believe gold will increase in value because of it. Inflation protection. In the past gold has been a decent protection against inflation, in high inflationary times gold tends to rise quickly. As the government printed trillions of dollars inflation is inevitable in the future, as inflation hits gold prices will continue to rise. Not Controlled by Government– Gold is a commodity and the government does not control it, there is only a limited amount of gold available. Current gold production is not keeping up with current global demand for gold, as demand increases so do gold prices. Maybe you do believe gold is a good investment but not sure how to invest in gold, here are a few ways one can invest in gold. With the recent gold buzz more and more gold mutual funds have come to existence, pretty much every mutual fund company now offers gold funds. You can also look at ETFs and gold index funds. If you are looking for bullion check out your financial institutions, most banks offer bullion to their clients. You can also purchase storage room from them if you do not have a safe place to keep them. Depending on who your broker is, you can probably purchase bullion from your brokers. You can now buy gold online, there are many online websites you can purchase bullion from, I wouldn’t trust every site I go on so do a little bit of research. 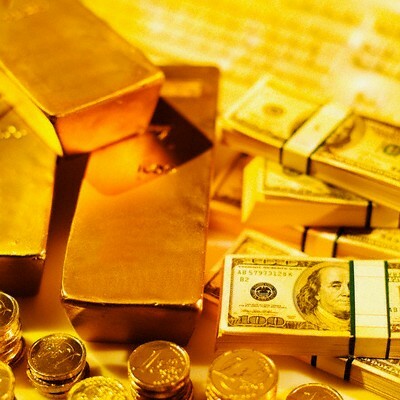 Are you a believer in gold investment? How do you invest in gold? What about the emotional aspect? Won’t people invest in it just because it is at new highs? People feel as though they are missing out on all the great returns that gold has given so they want a piece of that. They don’t care about rule #1, buy low, sell high. They want their piece of the action. They want a piece of the return. @EW true emotions are always a big reason for investing, with all the hype investors may just feel that they have to get into gold since everyone is talking about it. Nice article Ray, but I’d add ‘Greater Fool Theory’ to the list. (Do a quick Google if not familiar with the term 🙂 ). In the long run, gold has a 0 real return. And it has negative cost of carry to store it. While it works as a diversifier, there are better places to get inflation protection. Right now it is big as an investment because it is moving higher, and CNBC and the investing public are attracted to volatility in any form. We have to say that the ship to get gains from gold stock has indeed set sail. It does make for a nice diversified portfolio, but one should never buy it up in hopes of big gains. But that’s the market for you: hype, hype, and more hype! Ray, some good advice….brokers typically don’t offer bullion to their clients because they can’t make much from selling it. They may try and put you in an ETF like GLD instead. If gold has a long term “0 real return,” what does the U.S. dollar have as a real return since 1971 when Nixon took us off the gold standard in terms of purchasing power? Are you suggesting TIPS as the “better place” to get inflation return? Do you believe that gold is a leading indicator of inflation? If gold’s ship has sailed, are you suggesting that people don’t diversify some into gold as a hedge against any further dollar decline from a long term perspective, or just talking short term?